Holiday shopping? 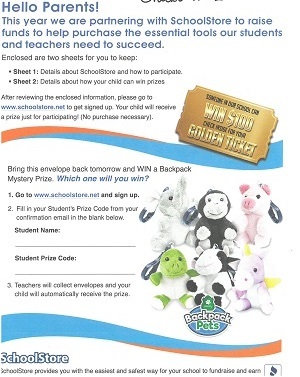 Don't forget that anything you purchase by connecting to your favorite stores through the SchoolStore portal will give us a bit of money toward our Reading Celebration program goals. No extra cost to you! This fundraiser is in effect through June. We get a percentage of the purchases that are made through the SchoolStore portal. Online shopping through this portal can benefit our Reading Celebration program at no extra cost to the consumer. 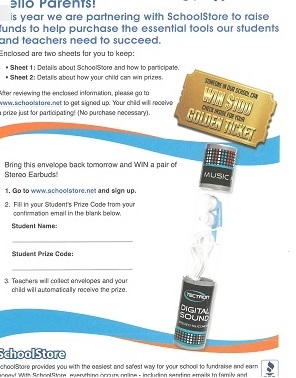 Students can still enter and return their envelopes if they still have them. The golden ticket worth $100 has not yet been claimed. Grades PK - 3: If you still have this envelope it's not too late!! Sign up to see if you have the ticket worth $100! Grades 4-5: If you still have this envelope, it's not too late!! Sign up to see if you have the ticket worth $100!